I'm starting a Chewbacca build (ANH, two-piece suit, 18" drywall stilts, kanekalon hooking). I'm 5'11". 1. I am having trouble finding good reference photos of the fur colour on Chewbacca's back. Do you think it is grey across the entire upper back (from shoulder top down to shoulder blades), as in reference photos from later films? 2. I'm using stilts, so where should I place the grey outer leg fur in relation to my body? The reference photos show from the hips to the knees. I was thinking of using my own hips as Chewie's hips, and my own knees as Chewie's knees, giving him long shins/calves due to the stilts. I'm also wondering about the T-Rex/short arm issue. Has anyone else used the 18" drywall bucket stilts (steppinup) who is around 6' tall? Were your arms too short for approval? If so, what did you do (cut the stilts, prosthetic arms, ...)? For avoid the t-rex arms simply let the arms of your suit more long. I've let a pair of centimetres over the tip of the fingers. It looks like I can cut and reinforce the stilts. That will bring me to 7'1" (12" stilts + 5'11" tall + 2" mask). I'll extend the fur 2" past the fingers. I use 15" stilts and I am 5'11" too. The mask usually adds 3-4" and I stand about 7'5" in my wookiees. I think it is the perfect height for me. Not too big and not too short. You definitely wont want 18" stilts though. To answer your question above: depending on the movie suit, some have more gray across the back and shoulders, but some are more darker brown with less gray. Im trying to do an ESB Chewie now and have decided to add more #4 brown to the #44 grey in about a 70% to 30% gray ratio. 5'2" here My mesh extends about 6" past my fingertips and the hair adds another 8"+ to that. Welcome to the Wookiee world! Thank you, Gato and Jamie, for the link to the reference photos, colour advice, stilt advice, and arm advice! Assuming arm length (shoulder to fingertips) is about 40% of the body height, I'm going to make my costume mesh arm length will be between 2'10" (7' tall Chewie) and 3'0" (7'6" tall Chewie). I tried the stilts, and they are a little awkward to walk in, so I'm researching a 7'0" build, with 10" of foam under my shoes. (5'11" tall + 3" mask + 10" foam shoes). The stilts by themself are narrow and should have a wooden base applied for stability. It also helps when you build up your foot. I hope this makes sense to you. I had difficulty building up foam lifts in my Chewie build because the foot looked too big and I abandoned the idea for stilts. There is a more stable option, Gato. Regular drywall stilts can be unstable and uncomfortable for some folks. Safety and comfort are really important. Steppin Up Highstepper bucket stilts with some simple modifications are really light weight and have a very sturdy base. Hi Jamie: I'm using Steppin Up Inc's High Stepper bucket stilts (http://www.steppinupinc.com/). 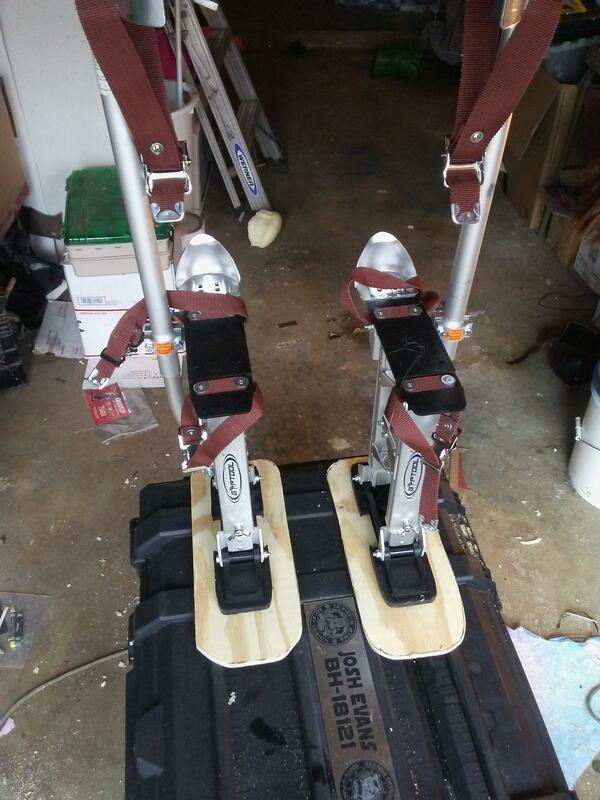 I used your instructions for building the stilts/knee brace. I also tested foam lifts. I bought some construction foam last night and made simple lifts stacked to 10". I found it easier to move around, but was worried about rolling my ankle. For safety, I'm going with the bucket stilts, cut to 12". Does anyone have suggestions about shoulder pads (what features to look for, possible brands/models)?